Hibachi grills are know for being simple and portable. Most of them have a small cooking area and we did the cast iron hibachi grill review on better grills. grills because of their durability and ability to keep the heat retained in the cast iron. 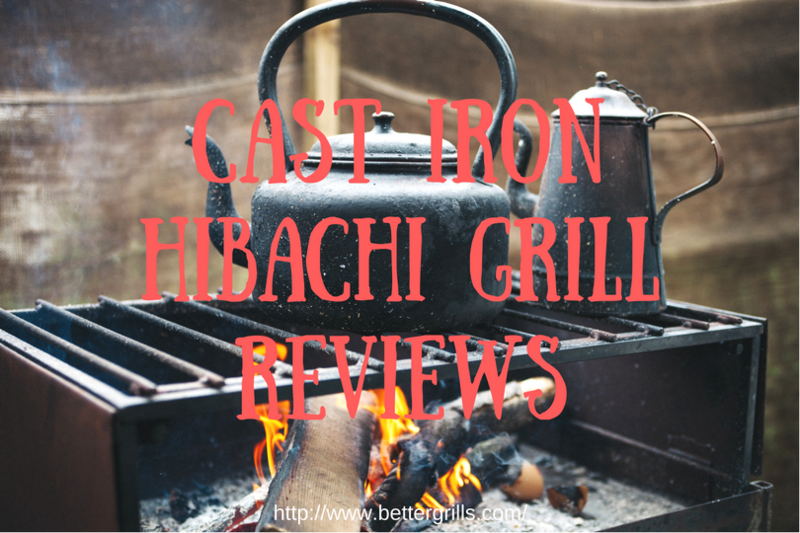 We start with looking at the two most popular cast iron hibachi grills and did a review on both of them. This Lodge L410 comes pre-seasoned and this is a big plus because seasoning a cast iron hibachi is not to easily done. 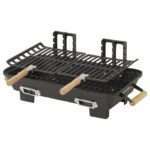 This lodge Hibachi is also the number one sold in the outdoor table top grills. You can read all the pros and cons and our opinion about this grill in our the review of the Lodge Sportsman grill. You can also click on the picture to go there. Since cast iron have been used for cooking and grilling because of the high quality it makes sense that this Cajun hibachi is made of that ever lasting material. Compared to the Lodge this hibachi grill is round and some people like that better than the rectangle shaped ones. 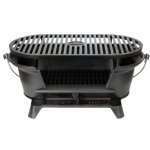 We rated this grill with 4.5 stars and that was because of the many great customer reviews. 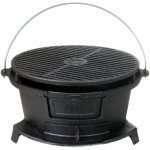 You can read the full review of the Cajun cookware hibachi grill 10447 here. This Marsh Allen charcoal hibachi grill is made of cast iron with some other metals used for the dampers. That is why we rated it a little lower than the lodge and the Cajun cookware models. The wooden handles on the two separate grill grates are very nice and stay cool and enables the option to move to grates to any of the 3 positions to adjust your grill temperature. You can read the full review of the Marsh Allen Hibachi Grill here. In a hurry? You can have a look at the price here! Although the cast iron hibachi grills are not very popular anymore there are still many people who love them for camping and tailgating. The advantage of using charcoal in combination with cast iron is the heat retention. One of the problems is sometimes that cast iron breaks easy when dropped. Although the Hibachi type of grill is very popular for years and years now there are more people who starting to look for a portable gas grill for its convenience and the fact that you don’t have to fool with charcoal. We did some of the top brand portable propane grill reviews if that is what you like to compare the Hibachi with.